What is your indoor air quality like? Did you know that a study by the U.S. Environmental Protection Agency (EPA) found that indoor air can actually be more polluted than the air outdoors (read the report). Considering that most Americans spend up to 90 percent of each day indoors, you may be experiencing indoor air pollution without even knowing it. Today, homes and buildings are sealed more tightly to conserve energy. Unfortunately, this seals in mold, pollen, bacteria and other pollutants. 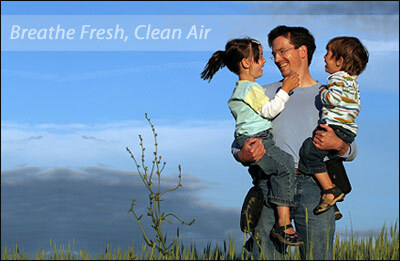 Harry Clark specializes at high performing indoor air quality products to purify the air you breathe! Ventilators, Air Cleaners, UV lights and Humidifiers work with your HVAC equipment to enhance the air quality in your home. Each offers a distinct method for an overall clean air solution. Ventilation systems replace a portion of stale indoor air with fresh outdoor air, reducing energy loss in the process. Air exchangers for instance, let users manually or automatically adjust the fresh air flow. The units retain energy used to heat or cool, saving money on utility bills. Ultraviolet air treatment systems or UV Lamps are designed to prevent mold spore growth on air conditioning coils. This technology, used for decades in water treatment, helps reduce allergic reactions to mold while enhancing overall air quality. Air cleaners offer an effective way to remove up to 99.98% of the particles - dust, pollens, pet dander, plant spores, fungi, bacteria, tobacco smoke, etc. - from the air that passes through the home. York offers both electronic and media air cleaners. Whole home humidifiers replenish the much-needed moisture in the air inside. This is important because warm, dry air absorbs moisture from everything around it, and breathing this air can be difficult.